There are five *.csv files provided with this dataset. 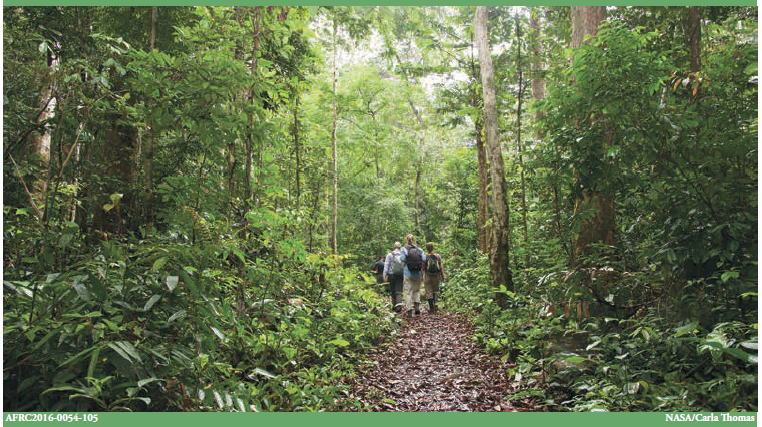 Figure 1: Collecting field data in Mondah Forest, Gabon. Credit: Carla Thomas/NASA (2016). This dataset provides (1) plot-level estimates of basal area, aboveground biomass, number of trees, maximum tree height, and basal-area-weighted wood specific gravity that were derived from (2) observations of nearly 6,700 individual trees including tree family, species, DBH, the height of each tree, and their x,y location within 25 x 25 m subplots. These field data were collected from 15 1-hectare plots located across the Mondah Forest of Gabon as part of the AfriSAR Campaign in 2016. These biophysical and biomass data were used for training the above ground biomass prediction models for the AfriSAR LVIS remote sensing above ground biomass density products. Thanks to Christelle Tayo, Vincent Medjibe and the Agence Nationale des Parcs Nationaux in Gabon (ANPN) National Resource Inventory Team for helping with the collection of the field data. Thanks to ANPN for helping with field permitting and research in the country. Many thanks to Nicolas Labriere, Victoria Meyer and the ForestPlots Team for helping with species ID and dataset cleanup. This data collection was funded through the NASA AfriSAR project. There are five *.csv files provided with this dataset. Note that the three plot-level files have the same structure. Mondah_Field_Data_Trees.csv Individual tree observations were collected at the 25 m x 25 m, or 0.0625 ha subplot level. Mondah_Field_Data_OrigCoords.csv The original field Global Positioning System (GPS) coordinates of each plot are also provided at the 0.0625 ha subplot level (GPS Coordinates). A value of -9999 means invalid data for numeric fields. For character fields the code for invalid data is “NA”. Zero, "0", is always a valid value. Table 1. The tree data file (*_Tree) contains the following columns with accompanying information. allom_key num indication of the allometry used to estimate biomass. 1 = use of pan-tropical allometric equation from Chave et al. 2014 if height measurement is absent, 2 = use of the pantropical allometric equation published in Chave et al. 2014 with real or modeled height. Table 2. Each of the three plot-level data files (*_Plot-1ha, *_Plot-0.25ha, and *_Plot-0.0625ha) contain the following columns. sp_ix num subplot column index. Each plot is divided into a number of columns and rows using the subplot information, the number being dependent on the spatial resolution of the output biomass values. Sp.ix are the column numbers, left to right. See Figure 2.
sp_iy num subplot row index. Each plot is divided into a number of columns and rows using the subplot information, the number being dependent on the spatial resolution of the output biomass values. Sp.iy are the row number, top to bottom. See Figure 2. Table 3. The data file with the original plot coordinates (*_OrigCoords) is organized as follows. See processing description below and note about limited usability. These data were used for training the above ground biomass prediction models for the AfriSAR LVIS above ground biomass density product. For each plot level aboveground biomass value we calculated the upper and lower limits of standard error of mass of above-ground standing trees and shrubs. These estimates are included in the data files. 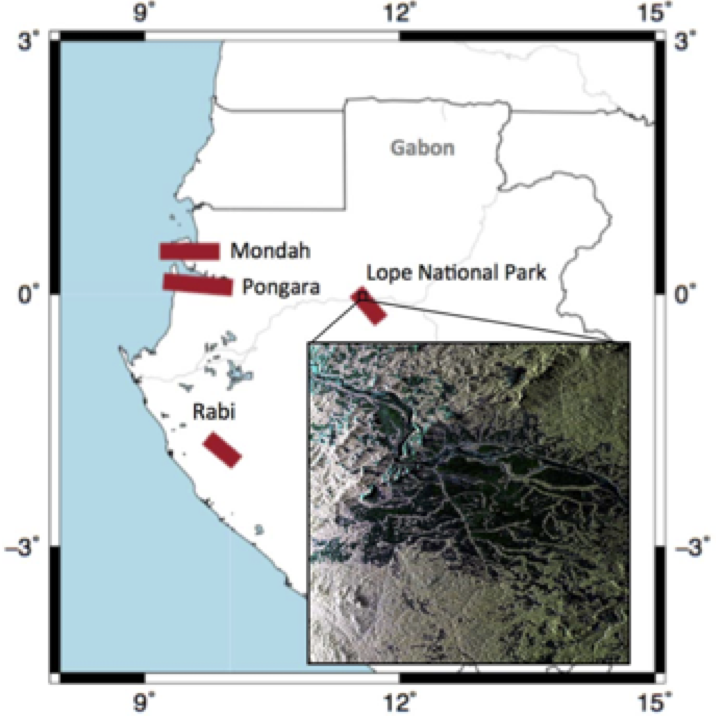 These field data were collected from 15 1-hectare plots located across the Mondah Forest of Gabon as part of the AfriSAR Campaign in 2016 (Figure 2). These biophysical and biomass data will be used for training the above ground biomass prediction models for the AfriSAR LVIS remote sensing above ground biomass density products. Individual trees were observed in 0.0625 ha subplots and plot-level data estimates were aggregated at 0.0625, 0.25, and 1 ha spatial resolutions. See Figure 3. For each 0.0625 ha subplot the data covers: GPS location of the 4 corners, x,y location of trees within a subplot, measurements of live tree family, species, DBH, height of each tree, and biomass at individual tree and plot level. Data file: Mondah_Field_Data_Trees.csv. Family and species of each tree was determined by a local botanist. DBH is the Diameter at Breast Height measured with a diameter measurement tape at 1.3 m height. Tree height measured in the field with DBH meter and a clinometer. Biomass of each tree is estimated using the Chave et al. 2014 equation with tree diameter, wood specific gravity (defined by tree species) and tree height. From the biomass of each individual tree, the biomass at plot level was calculated by adding the biomass of every tree within the 1 ha plot boundaries. At each plot level we calculated basal area, aboveground biomass, number of trees per plot, maximum tree height, and basal-area-weighted wood specific gravity. Respective aggregated data files: Mondah_Field_Data_Plot-0.0625ha.csv, Mondah_Field_Data_Plot-0.25ha.csv, and Mondah_Field_Data_Plot-1ha.csv. Biomass density information for different plot sizes was calculated by adding the biomass data for each individual tree within the boundaries of a certain subplot and divide by the area of that subplot to calculate biomass density for each subplot. Figure 3. Spatial arrangement of subplots (from left to right) for 1 ha (Plot-1ha), 0.25 ha (Plot-0.25ha), and 0.0625 ha (Plot-0.0625ha) spatial resolutions. The reconstructed stem map is shown on the right. The original field Global Positioning System (GPS) coordinates of each plot are also provided at the 0.0625 ha subplot level (Mondah_Field_Data_OrigCoords.csv). Note that geolocation errors from the GPS measurements caused the measured points to not create perfect squares. These points have been adjusted to create the weighted best plot locations which are provided in the three plot-level measurement files. These original coordinates are not provided in decimal degrees to clearly denote their limited usefulness. They are included only for completeness of the data collection record. Plot altitude (elevation) maybe useful. T.E. Fatoyinbo, N. Pinto, M. Hofton, M. Simard, B. Blair, S. Saatchi, Y. Lou, R. Dubayah, S. Hensley, J. Armston, L. Duncanson, M. Lavalle. The 2016 NASA AfriSAR campaign: airborne SAR and Lidar measurements of tropical forest structure and biomass in support of future satellite missions. IEEE International Geoscience and Remote Sensing Symposium (July 23-28, 2017) (Fort Worth, Texas, USA, TH3.L9.1). Lavalle, M., M. Simard, B. Riel, B. Hawkins, and N. Pinto. 2017. Tomographic imaging with UAVSAR: Current status and new results from the 2016 AfriSAR campaign. 2017 IEEE International Geoscience and Remote Sensing Symposium (IGARSS): 2485-2488.